Here at The Edible Forest, we try to raise our animals in the best way possible. Our pork comes from slow growing old breeds, which means the meat is darker, more tender and tastier than that produced in modern factory facilities with the fast growing large pink breeds that are currently fashionable. 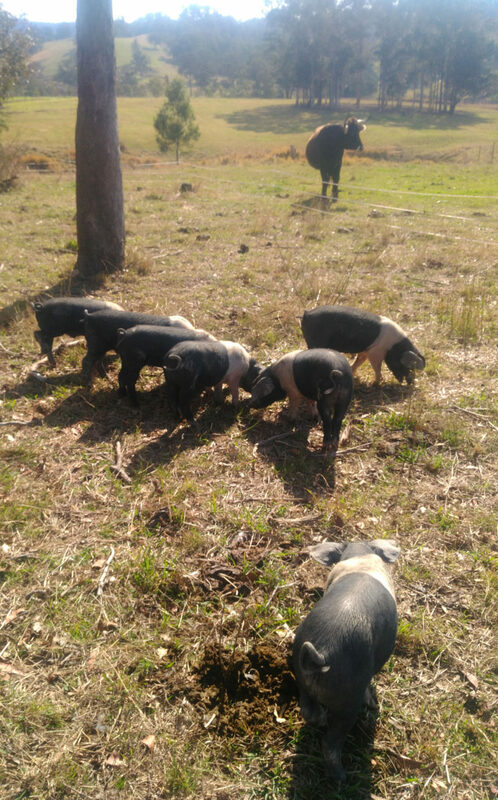 Our pigs all live outside, with easy access to all the things they need to be happy: food, shelter, shade, water and wallows. They enjoy a wide ranging vegetarian diet without chemical supplements. We do not use hormone or other growth promotants, nor do we use unnecessary insecticides or other chemicals around our animals. Electric fencing allows us to contain them, but also move them around easily, which means they help us improve our land, rather than destroying it as can sometimes be the case. When the big day comes, we transport our pigs ourselves, to ensure they are stress free to the end. This way, we have healthy, happy pigs, which means better food and health for us and our customers.